The second adventure in the „Whispers of the Dark Mother adventure arc clocks in at 28 pages, 1 page front cover, 1 page editorial, 2 pages of SRD, 1 page back cover, leaving us with 23 pages of content, so let’s take a look! Okay, first things first: It should be noted that this module contains a two-page write-up of the deity Amaura, the mother of life and oceans – this deity was first introduced in Cultures of Celmae: Majeed, but has been expanded in this module: We learn about priest’s roles, shrines, etc. While, flavor-wise, the deity write-up is pretty concise, you should be aware that no Inner Sea Gods-style obediences are included. The deity comes with 7 domains, but no subdomains noted, and sports two different favored weapons – the latter can render things slightly wonky regarding proficiencies etc. Still, as a whole, the prose is rather nice. The module also contains stats for the mythos grimoire that drove the plot of #1 – the lamentations of the fungus men. The tome comes with research DC, quick and concise little research rules (in case you’re not using them) and a nice “cost” for studying the tome. Spell-wise, colostrums cohort conjures forth lemurs with the entropic creature template added (having the stats here would have been more convenient). The symbol of the creator would basically be a variant of the Elder Sign as a spell – it protects against worshipers and creatures of the elder gods and is a level 1 spell, for pretty much every caster but witch, druid (weird, since shamans can cast it) and magi. The spell is pretty potent, but considering the context of the adventure arc, the PCs will need such an edge sooner or later. Now, the lamentations also contain a new occult ritual, the Ritual of Becoming. It is not one PCs should attempt. Kinda hilarious: Most mad cultists think that the failure of the rather difficult ritual is the intended effect. What’s the failure? Well, you call Gof duPog, the probably most unfortunately-named demon I’ve seen in a while – this fellow would be an advanced, entropic, gnarled goat demon (CR 7) and stats are included. It should be noted that I noticed some minor hiccups in the stats, but not to the point where using the creature would be problematic. The pdf also sports stats for the CR ½ lesser shadow (whose AC line has this explanation (+1 +2 deflection, +1 dodge, +2 Dex) – the first +1 is a remnant and should be deleted. Similarly, AC reads “14 15, touch 14…” – editing should have caught that. The pdf also includes a story-feat (nice), namely Enemy Cult. Problem: The feat is unusable as provided: Part of the Benefits-section is missing! It *looks* like it should grant you SPs (including symbol of the creator), but still – even casual checking should have shown that a whole pararaph’s missing from the feat! All right, so that would be the rules-section of the pdf – now, let’s move on to the module itself. This being an adventure-review, the following contains SPOILERS. Potential players should jump to the conclusion. All right, only GMs around? Great! So, after the chase that ended #1 of the series, the PCs will probably be stumped – they are promptly called to Sherriff Byron Tate – who offers a sizable reward for the apprehension of the one-eyed half-orc that led the assault on Lady Canterville. The PCs thus should have enough motivation to find out more about the assailant and the book – a brief table to gather information does provide further clues. Slightly weird: There is a DC 1-entry that basically constitutes failure and a hint to move the plot along. Ultimately, the PCs will venture into the Ogre’s Belly, where half-orc drunkards will try to mess up the PCs for daring to venture into “their” tavern. The likelihood of a bar fight is quite high, and 1d6 complications add a sensible amount of chaos to the proceedings. Slightly odd: The module introduces the “slick” weapon qualiy, which denotes weaponry that can render the floor slick (d’uh) or help escape grapples – while generally valid, the lack of a duration here is just one reason why the like is usually handled differently in the rules. The tavern comes with a solid full-color map, but one that is pretty small (too small for minis when printed out) and it comes only as part of the module’s pages – i.e., if you were to print out the page, you’d have about ¾ text on the page that you have to cut off. There is no player-friendly map of the tavern sans room numbers etc. These points of criticism, btw., extend to all of the maps featured in the module. Compared to the industry standard with maps in the appendix, often player-friendly versions as well, this is rather inconvenient and a big comfort detriment as far as I’m concerned. The numbers on the map are also kinda puzzling, since there are no room descriptions keyed to them – one room is relevant, I assume #7, judging from the room’s description. The PCs will sooner or later get the approval to look through Kemon’s room – an in it, they are assaulted by an iron cobra. Stats not included, not hyperlinked, not even highlighted in the text. Not how that’s usually formatted – at least the CR and source tend to be noted. If the PCs managed to save Faven in #1, they’ll be granted a scroll of lesser restoration and have some assistance regarding crafting. Yep, magic item not properly italicized. Anyways, the trail leads to the eponymous tower of hidden doors. Right before the tower, on the approach, there is a pumpkin patch, one housing a fully-stated jack-o’-lantern creature – a plant monster with a fear aura, a strangling entangle, etc. – per se nice, if weak critter. Which brings me to a balancing aspect: If the PCs hustle towards the tower (distance to Brighton is opaque), they are fatigued. No save, no check. That’s not how hurrying regarding overland travel works in PFRPG. Anyways, the rest of the module deals with the exploration of the tower. Each room comes with read-aloud texts, which is pretty nice, though there are some strange wordings here: “Only a single leaf bangs against the frame.”, for example, is a really weird piece of prose. I have never heard a leaf “bang” against anything. There also are a few instances where the formatting is weird. 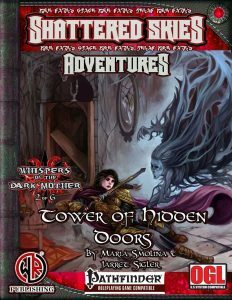 The tower itself has an interesting background story – Wovunda, a former oracle and adherent of the dark arts, has once perished in this place – his undead existence is responsible for the haunts that can be found in the tower. The undead has also stolen the book from the werewolf cultists, who still camp inside (!!!) after a run-in with the shadows of the place. How dumb can you get? Speaking of which: The guy who could not be caught by the PCs before is so dumb, he left a hint to where you can find him in his room in town, even though he can’t be tracked?? Then again, the werewolves are so alert, they automatically perceive the PCs. Stealth-rules? Why bother? Urgh. Unfortunately, the PCs won’t really find out any details about Wovunda – and the module doesn’t use the haunts to convey anything; they miss the chance of indirect storytelling. Another issue: At one point, the PCs can be penalized for having a good Perception. Yeah, not good design there. The BBEG of the module remains opaque, the haunts don’t really tell a story. Creatures are referenced in the text, lacking CR-values and proper formatting, making close-reading VERY important. In some cases, the text e.g. mentions using telekinesis to use chains to hit PCs – including damage-values, but not even a short-hand for the BAB. Monster-stats, where present, sport glitches in basic stats like attack-values. The formatting makes the werewolf-cultists look like they have magic items, when they don’t. Neither damage, nor attack values are correct. With the DR, the combat against them will drag sorely and be pretty annoying, in spite of their weakened nature. Not even starting with the incorporeal adversaries, which can break groups without the proper tools…which, at level 2, may well be almost all groups. This module is challenging in all the wrong ways, using incorporeal subtype and DR/silver as a basic tool to make what would otherwise be easy combats frustrating in all the wrong ways. Editing and formatting are no longer okay. It is readily apparent that this module did not see proper editing – from obvious formatting hiccups, to layout stuff that should be here (notes of monsters in room) to the math being wrong, this module is bad. Layout is gorgeous; a to-column full-color standard that is really nice to look at. The artworks within are similarly amazing – full-color, original, really nice. The pdf comes fully bookmarked. Cartography is full-color and solid, but the lack of big versions and player-friendly maps make this inconvenient. As always with Wayward Rogues Publishing, you can’t highlight/copy/text, which is annoying when you’re trying to fix the numerous glitches. You can get this module here on OBS.